IEEE 1394 “FireWire” Plugs & Sockets. Horizontal and Vertical Mounting Styles. 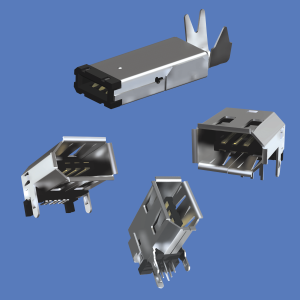 Available in Surface Mount and Thru-Hole Configurations. The IEEE 1394 “FireWire” bus is a Hi-Speed digital connection. It can be used to connect most electronic devices together over a single wire. This design is capable of becoming the universal connection between any device. Tin Lead Plated solder tails for excellent solderability Gold Plated contacts for low contact resistance and excellent reliability. • Superfast Data Transfer: Current speeds of 100Mbps, 200Mbps and 400Mbps, and roadmapped to 1GB per second (Gbps). • Daisy Chaining: Up to 63 devices, each one acts as an active repeater on the bus, with a maximum of 16 repeats. • Port Expansion: Alleviates restriction of limited COM Ports and available IRQ’s. • Wide Bandwidth: Digital interface designed for high speed applications for PC peripherals, consumer electronics and communications. Delivers services like Digital Video and Data without analog conversion. 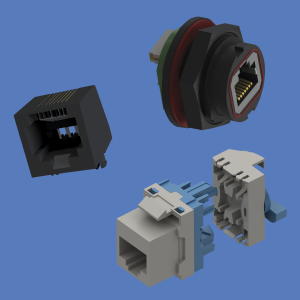 • Simple Connections: True Plug and Play – no jumpers, DIP Switches or IRQ’s to set. • Hot Swapping: Allows peripherals to be connected or disconnected without turning off computer. • Highly Versatile Bus: One bus can handle a variety of devices operating at different speed classes for true backwards compatibility. • Self-configuring: Operates unsupervised and in asynchronous or isochronous data streams to communicate real time data transport on one bus. • Standard Digital Interface: Allows consumer electronics and computer devices to communicate together on one interface. Horizontal (Right-angle) Entry PCB Mount. Vertical (Top-angle) Entry PCB Mount. Horizontal (Right-angle) Entry Panel Mount. Waterproof (IP68 rated) Jacks & Plugs. These keystone modular jacks provide a reliable connection to networks. Will mate with any plug that conform to FCC Part 68, Subpart F. Available as a surface mount, thru hole mount or panel mount. Right Angle or Top Angle plug entry and waterproof. Other options are available, do not hesitate to contact us for available options. • Durability: 500 cycles min. • Operating Temperature: -40ºC. +85ºC. • Snap-in stud to hold jack in position for wave soldering. • Tin Plated solder tails for excellent solderability. • Gold Plated contact areas assure low contact resistance and high reliability. PC Battery Holder Connector Jacks. Wire to Board PC Connector Jacks. 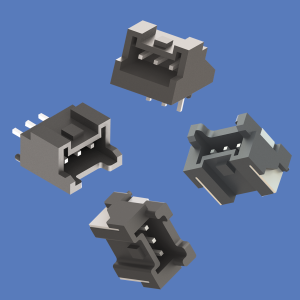 Available in Surface Mount or Thru-Hole Mount. • Jacks have keyed entry to prevent improper installation. • Quick Release locking mechanism for easy assembly / dissasembly. • Locking mechanism maintains a secure connection between battery pack and circuit board. • For use with Battery Holders with PC Connector. • Voltage Rating: 250 VAC. • Temperature Range: -25°C to +85°C. • Contact Resistance: 20 mohm Max. • Insulation Resistance: 1000 MOhm Min. PCB Micro Pins & Jacks. 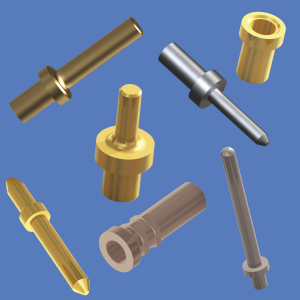 Swage, Solder, Press-Fit and Surface Mountable Styles. in a variety of mounting configurations to suit most applications. Custom micro pins & jacks manufactured to your specifications. Universal Serial Bus Plugs & Sockets. Type A, B and C.
USB 2.0, USB 3.0, USB 3.1, Mini-USB, Micro-USB. which alleviates restrictions of limited COM ports and available IRQ’s. They enable users to daisy chain up to 127 devices. 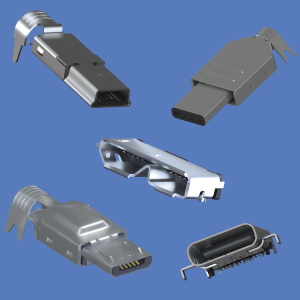 Data transfer rates for USB 3.0 are up to 480 Gbps. USB 3.0 sockets are backwards compatible with USB 2.0 plugs. • Snap-in PC solder tails to hold connectors in position for wave soldering.